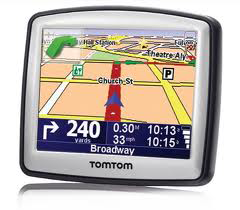 No long ago, my brother in law gave me his two year old Tomtom GPS. I’ve been having fun with it and have recently discovered that I could create my own sound file which would give me the directions–in Esperanto. In case you’re savvy, yes, I know there is one voice available, Ludoviko, to make the Tomtom speak Esperanto, but having loaded that into my Tomtom, I notice that… well, it’s not quite right, sort of like the creator of the voice had a dictionary, but hadn’t thought it through. So I now intend to create my own Esperanto voice for my Tomtom, which would then be available to anyone else in the world. The first step in doing this is to translate about 59 voice commands which the Tomtom speaks, sometimes in meaningful combinations to lead you around the countryside. Below is a table showing the 59 commands in English and my translations in Esperanto. I’d like anyone, preferably someone fluent in Esperanto to look at these and comment on if anything seems really amiss, like actually grammatically incorrect or stylistically obtuse. I’m open to any discussion on my choices. EDIT: I’ve updated the translations of a few of the commands on the list. partly based on discussions at Lernu.net. The thing that I think is giving me the most trouble is a translation of terms such as ‘RightTurn Ahead‘, ‘Ahead, Keep Right‘ It’s that darn word, ‘Ahead’. ‘Take the second left’ Ĉe la dua vojo, iru liven/maldekstren. ‘Take the second right’ Ĉe la dua vojo, iru dekstren. ‘Take the third left’ Ĉe la tria vojo, iru liven/maldekstren. ‘Take the third right’ Ĉe la tria vojo, iru dekstren. ‘ahead, Exit left’ Antaŭe eliru liven/maldekstren. ‘You have reached your destination’ Vi alvenis. Kien ajn vi iras, jen vi estas! ‘Depart’ (only heard when you tap Test when selecting a voice) Ekiru. Pork e vi sciu, mi uzas la vorton ‘liven’ anstataŭ ‘maldekstren’. ‘Stay in the left lane’ Restu en la liva/maldekstra koridoro. ‘Leave the motorway at the exit on the left’ Eliru la aŭtovojon per la liva/maldekstra elirvojo. ‘Leave the motorway at the exit on the right’ Eliru la aŭtovojon per la dekstra elirvojo. ‘Go around the roundabout’ Iru laŭ la voj-rondiro. ‘Cross the roundabout’ Iru trans la voj-rondiron. ‘Go left on the roundabout’ Iru liven/maldekstren laŭ la voj-rondiro. ‘Go right on the roundabout’ Iru dekstren laŭ la voj-rondiro. ‘Take the ferry’ Veturu per pramŝipo. Ĝuu la mar-aeron. ‘Turn around when possible’ Returniĝu kiam eble. ‘Make a U-turn’ Faru returniĝon. Note the commands which are shown in bold are seldom used and the instructions for creating your own voice recommended that these few could hint at humor since they won’t be hear at every turn. I still need a translation for ‘Congestion Charge’. This is evidently something specific to central London and I’m not sure quite what to call it. It’s important in case someone else actually puts my Esperanto voice on their Tomtom. If you don’t want to comment on the blog, you can contact me at NJ. Esperantist@gmail.com. Oh, and something short but humorous to put after ‘Make a U-Turn’ would be appreciated too. This entry was posted on April 16, 2011 at 5:04 pm and is filed under esperanto, Odd Bits. You can follow any responses to this entry through the RSS 2.0 feed. You can leave a response, or trackback from your own site.